Inside the police station, LTC Kurilla, Commander of Deuce Four, met with the brother of a taxi driver killed on Monday. Deuce Four believed they wrongly shot the man, so they chose to pay condolence compensation to a member of his family. The brother nodded and said ensha’allah, an expression meaning that it's God’s will that he died. I have seen the parents of children killed by car bombs say ensha’allah as if it makes it all comprehensible. Kids blown up, ensha’allah; airplanes fly into buildings, ensha’allah; the electricty goes out ensha’allah. Yet then many ask--without a twitch of irony--why the Americans cannot make the electricity stay on in Iraq: terrorists blow up the generators, ensha’allah. LTC Kurilla and the surviving brother talked for about ten minutes, the brother said ensha’allah one last time, they shook hands and the man departed. As we drank Pepsis with the police commanders, Major Khalid kept asking LTC Kurilla to call the Mosul water directorate to get a bigger water pipe, and to call the Mosul electric company to get national power lines installed, (this,despite having a $50,000 generator provided by the US Army.) It was as frustrating for me to listen as it must have been for LTC Kurilla to answer. As we stood to leave, much shooting began. The sounds of various types of small arms and machine guns firing echoed about the buildings, so we ran outside to the Strykers. A car had driven by and shot at our guys. SSG Munch was certain he hit the car with his rifle, but didn't think he killed anyone. So we were looking for an Opel—seems we are always looking for Opels—with new bullet holes. After some searching, we didn’t find the Opel, and headed over to the 4-West Police Station. The neighborhood is a mess of bombed-out, shot-up buildings, and there is a mosque next to the police station. In fact, terrorist mortar crews have admitted to using the tall minaret as an aiming reference point when bombing the police; and the police use the same minaret as a sniper position. The 4-West police station is attacked numerous times every week and has the walls to prove it. Only some months back, the station was briefly famous in the world news when the police ran away and terrorists seized the station. But the terrorists didn't seem to have a plan after siezing it, so the Americans took it, then gave the station back to the police. Now, occasionally, when we arrive, there is fresh blood on the floor, but the police are quick to clean this up. Colonel Eid is the commander of 4-West, and his men kill a lot of terrorists, so the terrorists seem to hate him as much as they hate us. They are definitely trying to get him: Colonel Eid has been shot twice, and just a few weeks ago, was wounded by an IED that killed his driver. Whenever we meet with Colonel Eid, some of us expect a terrorist to walk in wearing one of those exploding vests. Walking into the meeting with Colonel Eid, I smiled at Air Force SSG Will Shockley and SGT Thomas, who were standing outside guarding the door. Nobody will ever believe Shockley if he tells them what he’s seen in Mosul, but these Air Force guys are right here in it. As I walked by, I punched SGT Thomas in the shoulder, trying to leave a bruise as payback for some bad camera advice he had given me. I liked Thomas, but hoped his arm hurt. There were nine Iraqi police commanders, and an Iraqi Army officer, plus four American officers in the room. The meeting seemed to go on and on and on. Finally we departed, and there was Thomas at his post. 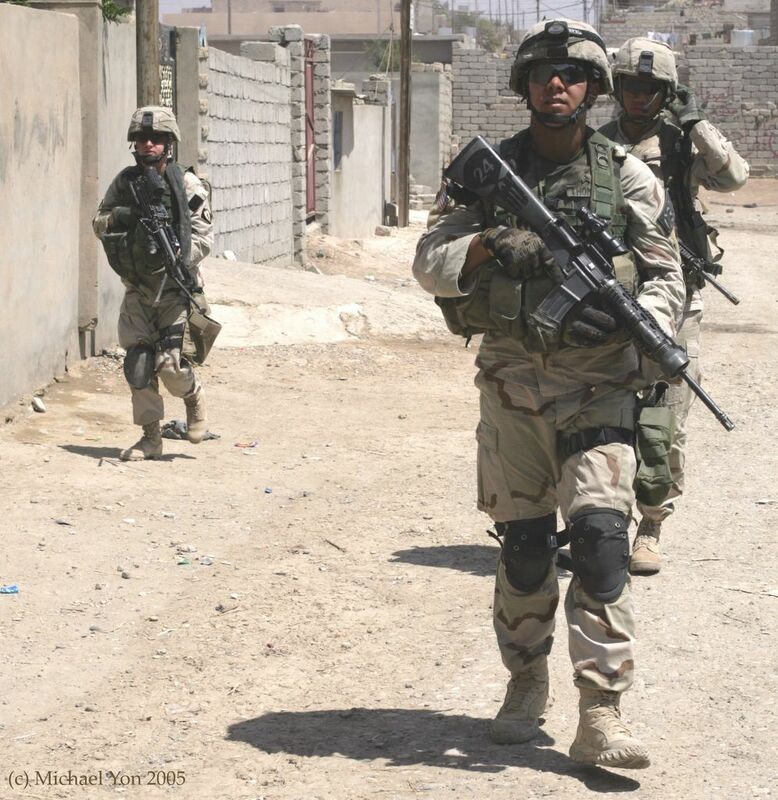 As we passed, I said, “Let’s go boy!” and I walked out with all the soldiers, and the lone Air Force man, SSG Shockley. We often get attacked by snipers, so I've come to expect it. When we walked out, there were a few moments of gaggle, so I took a knee to present a smaller profile. Soon enough, everyone loaded onto the Strykers, the ramps closed and we headed out. About four minutes later, Chris Espindola, who had his ear to the radio, told me that one of our guys just got hit by a sniper. “Who got hit,” I asked? “Thompson or Thomas?” I asked. What I said next is not fit to print. I really liked Thomas. I felt sick. The mission veered in a new direction, and we started searching for the sniper. Thomas was in Charlie Company, and Charlie Company soldiers were out there searching, and some Special Forces guys showed up to help, but we all knew the score. Short of a very lucky break, we were not going to find that sniper, but knowing the odds didn’t stop the soldiers. They searched for hours, checking here and there, trying to find someone who had heard the shot, asking neighbors and shop-owners if they had heard or seen anything. 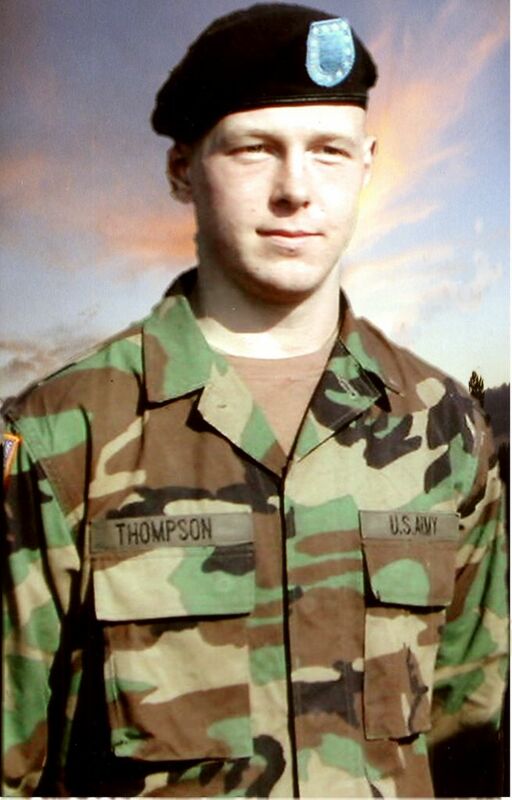 “That was my roommate, Thompson,” he said. But we were moving out and heading back down the stairs before I could say much more. PFC Nils Thompson had just celebrated his 19th birthday the day before. Nils was deeply religious, and would go to Catholic and Protestant services. He was a great kid and everybody liked him; but we were in downtown Mosul searching for the sniper that killed him, and had to stay focused. There weren't many clues. The best we could piece together was that a sniper came in a car, used an SVD rifle, and hit Thompson in the head while he stood in air-guard on the Stryker. We headed back to base, and over to the Combat Support Hospital. Going to the CSH is much different when we lose a soldier outright like Nils Thompson. When soldiers die on the battlefield, they are still brought to the CSH, but their buddies don’t wait around in the waiting room. Usually the commander comes in and pays his respects, then the men come in, pay respects and leave. I walked in behind LTC Kurilla. The room was silent, chilly, and bright. There was only Nils, the Commander, and me. Nils' hands and face were pale, and there was a stained gauze bandage wrapped around his head, and a green wool blanket covering the rest of him. The Commander put his hand on Nils’ shoulder and closed his eyes. I could see he was praying. I closed my eyes and said a prayer. And then we left without a word. Chaplain Wilson was there in the hallway with some Deuce Four officers. He’s a great Chaplain, sometimes going out on the battlefield. The men respect Chaplain Wilson, and he somehow made things feel a little better. The other men had not arrived yet, so I went out to sit alone in the waiting room. SGT Peckham came and sat on the floor beside me but I didn’t have much to say. I hope he didn’t think I was being rude, but I was thinking about Thompson and all the fighting he’d seen in the five months since he first arrived here. I was thinking how he just turned 19 yesterday. He’s gone. Thompson’s platoon walked in and some of them nodded to me as they walked by, heading back to the room where their friend lay. They spent a few minutes, but I didn’t go because that’s a time when soldiers should be with soldiers. A few minutes later, in a heavy silence, we all walked out, loaded the Strykers, and went back to work, battling for Mosul.